click on desired pattern & follow required steps. Custom made in USA to fit any shape cushion. Features Concealed Zipper Construction. Swatch Samples: Available for all fabrics. When you finally find the right couch, it can feel like you're on top of the world. After all, it's the right size, has the perfect level of softness, and didn't cost you an arm and a leg. But maintaining this couch can seem impossible with kids, guests, and pets wreaking havoc on the integrity of your home. When you want to preserve your furniture for years to come, rely on the quality products from SlipcoverShop.com to protect your most valuable pieces of furniture. 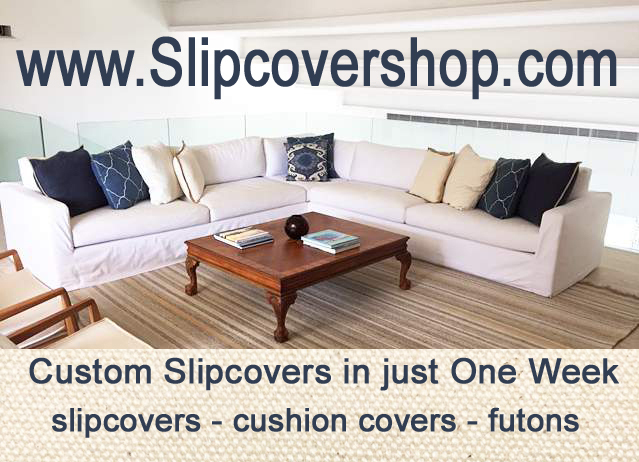 SlipcoverShop.com and our parent company, Easy Fit Inc., have worked hard for years to craft custom slipcovers, zippered cushion covers, and other innovative products to keep your furniture in tip-top condition. Whether you want to breathe new life in your existing furniture through a couch slipcover or you want to preserve the quality of your new sofa, our custom pet cover solutions and covers will help improve your home -- and your life. How can we protect your couch? Our products are easy to clean, will retain their shape, and look great for an affordable price. Let SlipcoverShop.com enrich your lives through our quality materials, excellent customer service, and exceptional value. Our site makes it easy to price and purchase your custom materials online. Contact us today for more information on zippered cushion covers, slipcovers, and more!